Much in the same way babies are not simply miniature adults, puppies are not simply miniature dogs. Growing and maturing is a difficult process and special nutrition is needed to fuel it! Young animals are especially sensitive to dietary needs, and owners need to pay close attention to what food they provide during a dog's first year of life. So, what are the special nutritional needs of puppies? 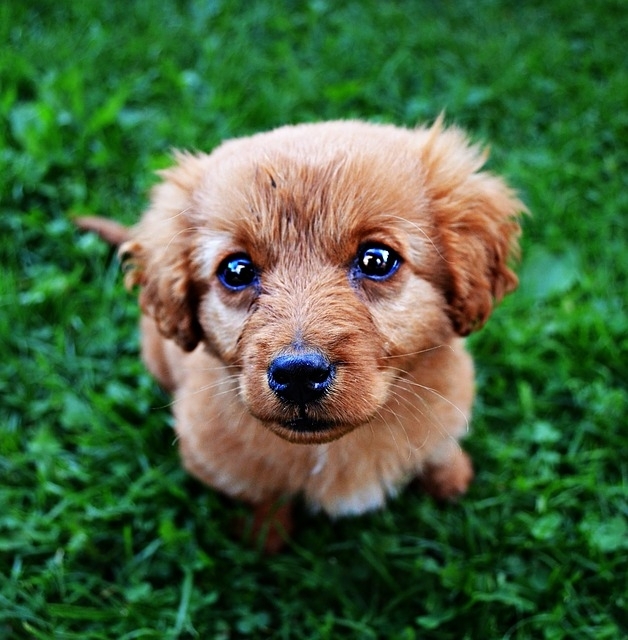 Puppies require a more calorie-dense food than would be necessary for the typical adult dog. High quality puppy foods have around 445 kcal per cup while an adult food of the same caliber would have around 375kcal per cup. It doesn't seem like a huge difference, but the extra calories are very important in the long run! Check out this infographic about minimum nutrients requirements for puppies compared to adult dogs! 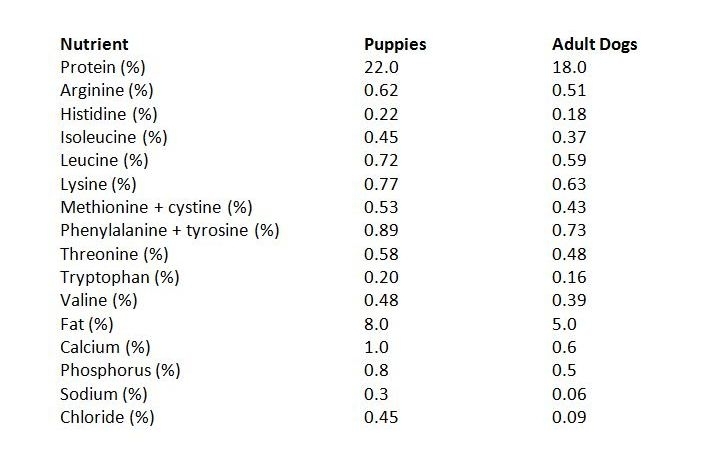 You can see that puppies need more of many important nutrients than adult dogs do. For example, quality diets should contain high levels of certain Omega 3 Fatty Acids to promote Healthy Skin, a Glossy Coat, and to optimize Brain & Eye Development! Owners of large breed puppies have additional issues to consider while picking out foods: Developmental Orthopaedic Diseases. Abnormal growth rates are a major risk factor for Hip Dysplasia and similar conditions. Diets designed for large breed puppies should have a lower fat content and therefore a lower caloric density than diets designed for small and medium breed puppies. Eating foods with too much calcium and phosphorus increases the odds that a large breed puppy will be affected by a developmental orthopaedic disease. Whether your puppy is going to be the size of a Mastiff, or a Chihuahua, make sure you pick a food that provides balanced nutrition for this unique time in their lives, and that is made from the wholesome, natural ingredients necessary to encourage a lifetime of good health. If you have any questions about which foods to feed your puppy, contact your veterinarian for advice!